May inhibit bone resorption and stimulate bone formation. May prevent the onset of osteoporosis. Orthosilicic acid is the water-soluble form of silicon found predominantly in seawater. Stabilised by choline, it has particularly good bioavailability. Silicon is present in many bodily fluids and tissues. It plays an important role in the health of the bones, joints, blood vessels as well as that of the skin, teeth, hair and nails. 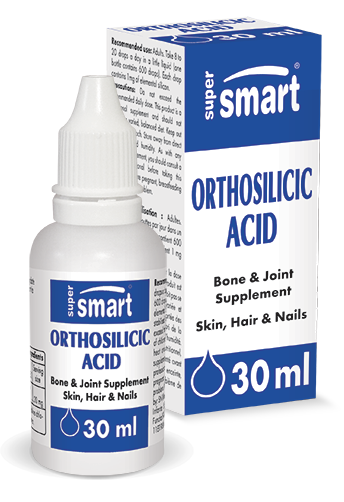 ¤ Animal studies suggest that silicon supplementation reduces the number of osteoclasts, the cells responsible for bone resorption, and appears to increase levels of osteoblasts, responsible for bone formation. Clinical studies show that in women with osteoporosis, silicon supplementation is associated with a significant increase in bone mineral density. Silicon accelerates healing of bone fractures. ¤ High concentrations of silicon are found near sites of intensive calcification, such as in the case of a fracture. Various trials conducted following fractures associated with trauma, or at the time of surgery, suggest that silicon supplementation promotes faster and better healing. Silicon is essential for the formation of joint cartilage. In addition to its role in ensuring calcium deposition in bones, silicon is also crucial for the synthesis of glycosaminoglycans (GAG) which are abundantly present in cartilage and have significant capacity for retaining water. They include, in particular, chondroitin sulphate, dermatan sulphate and hyaluronic acid. Silicon is an important ingredient of the arterial wall. ¤ After the skin and the thymus, the aorta is the body tissue which contains the most silicon. With advancing age, levels drop rapidly, suggesting that this loss may play a key role in the ageing of the arteries and increases the risk of damage. Post mortem studies have highlighted decreased silicon levels found in the arterial tissue of atherosclerosis patients compared to healthy arteries. The aorta and the carotid artery of healthy individuals contain ten times more silicon than atheromatous arteries. Animal and human studies show that silicon supplementation combats LDL oxidation, a key step in the development of atherosclerosis. Skin health is associated with its silicon content. ¤ Silicon is essential for optimal synthesis of collagen and elastin. It is also crucial for the activation of hydroxylation enzymes which intervene in collagen cross-linking, responsible for the resistance and elasticity of fibrous proteins. A higher level of collagen is synonymous with more elastic, less wrinkled skin. In a study of women aged 40 to 65 showing clear signs of skin photoageing, supplementation with orthosilicic acid reduced fine lines and improved skin elasticity. Silicon supplementation makes nails harder, shinier and less brittle. ¤ It also seems to be able to slow down hair loss, and promote hair regrowth and shine. Other ingredients: Choline chloride, glycerin, distilled water.